The Australian Veterinary Association is calling on all pet owners to celebrate Polite Pets Month this March. Does your pet have anxiety, phobia and behaviour issues? This March, you can learn more about how to have a polite pet as part of the Australian Veterinary Behaviour Interest Group’s Polite Pets Month initiative. Polite Pets Month aims to educate pet owners, and their veterinarians, on what makes a polite pet and how to deal with underlying anxiety or behavioural issues that may affect your pet. Information and support for owners is a critical link in this program. A pet’s behaviour is often reflective of the owner’s skill or knowledge in supporting their pet to overcome anxiety, phobias or aggressive behaviours. All pets should have the opportunity to be well-adjusted and polite members of the community- both in the home and outside. 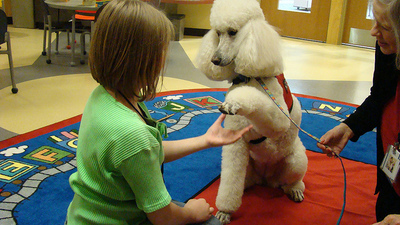 Polite Pets Month put forward the idea that mental health is important for your pets too. Polite Pets Month is an initiative of the Australian Veterinary Behaviour Interest Group and with the support of its foundation sponsors: Royal Canin, Feliway and Adaptil. For more information, talk to your veterinarian or visit Polite Pets Month.